Henning (population 241) is located in eastern Illinois in central Vermillion County. U.S. Route 136 passes through Henning which sits just a stone's through west of Illinois Route 1. The C&EI Railroad (Chicago and Eastern Illinois) and the IC Railroad (Illinois Central) both had spurs that crossed in Henning. The IC is no longer active; the C&EI spur ends in Henning for the purpose of serving the grain elevator still there. The Indiana / Illinois state line is just 9 miles east of Henning. A town of note in the area includes Danville just 11 miles south and a little east of Henning. The history of Henning and the origin of its high school is not available at this time. It is known that Henning residents supported their own school system for many years. The school, established probably in the late 1800s, flourished for about 7 decades. We know from those who lived through the period that it was in the early 1960s that the consolidation talks began between the high school districts of the towns of Bismarck and Henning. These talks eventually became a reality in 1964 with the creation of the Bismarck-Henning School District. All schools for the Bismarck-Henning system are located in Bismarck. The fate of the original Henning High School building is a good one. The building has been turned into a very successful factory that manufactures a variety of products. The gymnasium seerves as a laboratory and office space. A photo of the building as it appeared in August of 2013 is available below. Congratulations to Henning on their great success story! School Fight Song: "Henning School Song"
Knows how to obey each and every rule. "Now there goes a group I'd like to know." They have that good ol' Henning zip and go. Henning High School definately offered basketball as a sport. Baseball and track may have also been offered but are not mentioned on the IHSA web site. The English Department at Henning had one great year when the tiny hamlet of Henning hung with the big boys in team and Individual Speech competition. These accomplishments are listed below. We are searching for the school team nickname at HHS as well. The only mention of the Henning High School boys basketball team is of the lone District Championship won by the boys of 1936-37. No other team records or coaches names are listed. If you have any of this information to share it would be deeply appreciated. We have located a website titled "Illinois Postseason Basketball Scores" which has scores from the IHSA State Tournament listed. The scores we located that involved Henning High School are reprinted below. *Postseason scores from the begining of the program through 1932-33 are not available. 1937-38 through 1947-48 Postseason scores, coaches' names, and records needed. Stockland lost in semi-final round. Crescent City lost in semi-final round. Sheldon lost in semi-final round. Potomac lost in title game. East Lynn lost in semi-final round. One Henning HS lad carried the school to great heights, putting Henning on the map in the world of speech competition in the mid 1940s. The efforts of thespian Merle McConnell earned the Henning High School kids a 4th Place finish in the state competition in 1946. His efforts are listed below. Merle McConnell Oratory Declamation STATE CHAMPION!! Merle McConnell's efforts also led the Henning High School speech team to a tenth place finish in Speech Sweepstakes!! The final team standings are listed below. 1945-46 Team Finished TENTH in State Competition!! 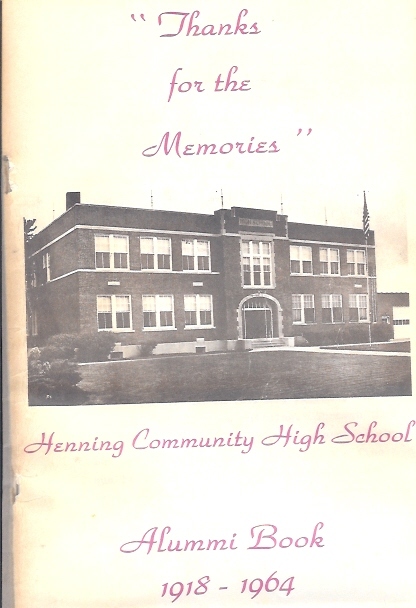 "My Great Grandparents, Grandparents & Parents went to Henning High School in Henning, IL. Soon after it closed, they re-opened the building to hold Elementary grades there. I actually went to this building for my 4th, 5th & 6th grades in 1974 - 1976. 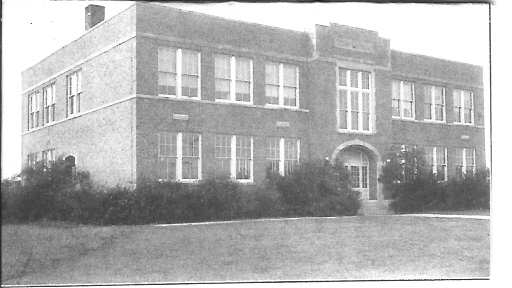 (The original Elementary School was just down the road and held K - 3rd grades) Once you reached 7th grade, you were sent to Bismarck for consolidated Jr. High & High School (currently the Bismarck-Henning High School). Today, the Elementary School has been torn down (I would LOVE to have a picture of that building!) and sadly, the Henning High School building has been sold to Ful-Fill, an aerosol manufacturing company. They have maintained and updated the school portion of the building to house offices for the plant, and then added on to the rear of the school for manufacturing facilities." "I am told that my grand father, Harry Young of Henning, a farmer and father of 8 (4 boy's 4 girls), drove and built the body for the bus for the high school. I am not certain of the time frame. He is survived by grand children and a few cousin's ( I have a house full of cousins)." To Merle McConnell for providing a great deal of the information on this page. Congratulations to Merle on his great accomplishments! If you have ANY information you can share regarding the many great successes of Henning High School, please send it to us to we can share with others. There had to be other great teams and great accomplishments that may be forgotten if not shared here. A photo of the old High School building is especially being sought.